On this date in 1938, Stalin’s purges claimed Soviet economist Nikolai Kondratiev. 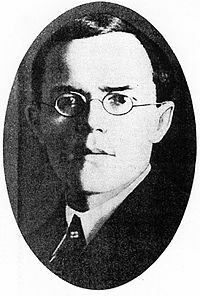 Not the most recognizable name in the Soviet Union’s 1930’s bloodletting, Kondratiev — also transliterated Kondratieff — was a pre-Keynesian economist of some note, who had a prominent hand in the fledgling USSR’s early agricultural direction. Thus far goes the portfolio of many a forgotten academic or bureaucrat shot by Stalin. But Kondratiev made a contribution still much remembered — and one that might just be due to re-emerge from its occult hibernation. In a series of 1920’s papers, Kondratiev worked out the theory that capitalism had 50-to-60-year economic supercycles. Though not strictly the first to so hypothesize, he put the idea on the map; the (alleged) pattern still bears the name “Kondratiev wave” or “Kondratiev cycle”. His belief that the intermittent major crises punctuating capitalism were not building towards systemic implosion but clearing the economic debris of bygone ages and allowing new growth were not the least of what got him into hot water with Stalin. “Creative destruction,” as Joseph Schumpeter would call it, adapting the idea. Though sidelined from mainline economics for much of the 20th century, Kondratiev waves have never gone entirely out of fashion. Congenial to any number of collateral theoretical hobbyhorses — technological innovation, entrepreneurship, generational psychology, statecraft, and the eternal bracing for end times right around the corner — Kondratiev waves are a niche player in economic theory both conventional and otherwise. Here’s a site that lovingly describes them. Its problem, even if you happen to buy into the concept, is its near uselessness as a predictive tool: half-century cycles don’t just arrive like clockwork, and the timing and very existence of particular cyclical epochs is highly dependent on the interpreter’s choice of data. The margins of error run out to decades. You never know at any given moment what you’re looking at — so you can find the supercycle crashing in 1998, or beginning its springtime of growth in this decade. That very uncertainty accounts for Kondratiev’s intermittent mainstream resuscitation during economic crisis: when worried about Where Things Are Headed, some version of a Long Wave theory is almost sure to have a story to tell. According to the New York Times‘ database of past articles, the word “Kondratieff” (its preferred transliteration; “Kondratiev” yields stories about New York Rangers prospect Maxim Kondratiev) went essentially unmentioned in the post-World War II paper before appearing in 20 articles from 1973 through 1984 — the period when the capitalist core was buffeted by energy crisis, stagflation, and the punishing Paul Volcker recession of the early Eighties. And then Kondratiev/Kondratieff faded from the Grey Lady; after a few appearances during Wall Street’s woes in the late 80’s, it doesn’t seem to have appeared in print there since an offhanded reference in a 1992 William Safire column. Have you seen the news lately? It’s mighty Kondratiev-friendly. His cycle of exclusion has probably just about run its course, and if you’re the wagering type, I’ll take Thomas Friedman against the field. Behind the theorems, of course, there was the flesh-and-blood man; it so happens that not many dismal scientists went as poignantly as our principal. Initially imprisoned in 1930, Kondratiev served eight years before he was re-sentenced and executed; he ached for the separation with his family. Kondratiev’s daughter, Elena — Alyona or Alyonushka in the Russian diminutive — preserved his correspondence to her, the only remnants of her father in her life. The last letter — as it turned out; plainly the writer had no inkling of it — was dated August 31, 1938. Probably your holidays are over now and you are back at school. How did you spend the summer? Did you get stronger, put on weight, get tanned? I very much want to know. And I would like very, very much to see you and kiss you many, many times. I still do not feel well, I am still ill. My sweet Alyonushka, I want you not to get sick this winter. I also want you to study hard, as you did before. Read good books. Be a clever and a good little girl. Listen to your mother and never disappoint her. I would also be happy if you managed not to forget about me, your papa, altogether. Well, be healthy! Be happy! I kiss you without end.